"BIG, top of the world 360 degree views; Pacific to the mountains, Vista Valley CC and beyond. 4912 Sq. feet of luxury situated on 8 acres in the Gopher Canyon corridor of Vista. New 1500sq.ft+ det. car/rv garage is perfect for the car enthusiast. Year-round outdoor living w/ 750 sq.ft. cabana, outdoor exercise area, spa, lap pool w/custom domed cover, gazebo, outdoor kitchen patios, play area. No expense spared on the interior. A must see! Leased solar system. Bonsall School district. Neighborhoods: Trinity Equipment: Dryer,Fire Sprinklers,Garage Door Opener,Pool/Spa/Equipment, Vacuum/Central Other Fees: 0 Sewer: Septic Installed Topography: GSL"
"WOW, JUST WOW! This property is special from the moment you walk on the premises. If you are looking for horse ranch property with plenty of space around you this is it. There are 2 houses on the property, one is not permitted but in use by family members (3 Bed,2 baths). The other is permitted (2 Bed,2 baths). The horse stable holds approx. 20 horses, all in separate stalls. The office and tack rooms are also part of the stable. There is one HUGE riding arena, and more. Call Mia Worley 760.688.9077 Neighborhoods: Rancho Mar Vista Equipment: Shed(s) Other Fees: 0 Sewer: Septic Installed Topography: LL, Guest House Est. SQFT: 1800"
"Have you ever wondered what it would be like to Sit on Top of the World with Panoramic Ocean Views? This Once in a Lifetime Opportunity has now arrived! Amazing Views from every room in the Home! This Open Floor Plan with a Chief's Kitchen is an Entertainer's Delight! Resurfaced Pebble Tech Pool with Spectacular Water Falls has Custom Controls from the Spa allowing you to adjust the Lighting, Jets, Water Falls, Heater! Make arrangements today to this Home Today! Enjoy the Virtual Tour! See Supplement! Neighborhoods: Buena Creek Equipment: Garage Door Opener,Pool/Spa/Equipment Other Fees: 0 Sewer: Septic Installed Topography: LL,RSLP"
"Welcome to the magical Hope Ranch. This sprawling hilltop property consists of one newer main house and three additional cottages perfect for a family compound, income properties, potential rehab/assisted living facility farmland or anything you can imagine. The main house, with 4 bedrooms, 3 bathrooms and roughly 2400 square feet, was constructed in 2014 in the center of the surrounding out-buildings. The cottages are filled with an abundance of beauty and character you must see to believe. Neighborhoods: Vista Equipment: Fire Sprinklers, Range/Oven Other Fees: 0 Sewer: Septic Installed Topography: LL,,GSL,SSLP"
"This breathtaking 16 Acre Estate offers extravagant living space with stunning views, overlooking the well established Vista Valley Country Club and sprawling hills and valleys of Bonsall, California. Enter through your elegantly designed wrought iron doors to this impeccable home that immediately greets you to your back country view you didn t know existed! Every room of this Estate has been created to feel completely open and spacious for true luxury living. See supp. Neighborhoods: Panoramic Estates Equipment: Dryer,Garage Door Opener, Washer Other Fees: 90 Sewer: Septic Installed Topography: LL,,GSL,SSLP"
"Seller will entertain offers between $1,495,000-$1,695,000 Come and own a piece of California History . Remarkable panoramic ocean views catch one s eye from this private, gated original Adobe 4 bedroom/6 bath paradise rich with attention to detail. An entertainer s dream with pizza oven and elevated pool area with 38 ft. cascading water fall with rock slide with westerly views. Old world charm and new world amenities blend to make this a romantic place to call home. THIS HOME IS A MUST SEE! Neighborhoods: Foothills Architectural Style: Monterey/Hacienda/Adobe View: Monterey/Hacienda/Adobe Equipment: Dryer,Garage Door Opener,Pool/Spa/Equipment, Shed(s), Washer Other Fees: 0 Sewer: Sewer Connected Topography: ,,RSLP,GSL"
"This breathtaking, single family paradise offers extravagant living space with stunning views, overlooking the rolling hills of Vista Valley Country Club, Bonsall, and beyond. Tucked away in the exclusive gated community of Panoramic Estates, this 4-bedroom, 5 -bathroom home, includes a 3-car garage with designer garage doors, offering approximately 4,500 square feet of spacious elegance on its 4+ acre lot, suitable for a vineyard, orchard, or swimming pool. See Supplement. Neighborhoods: Vista Architectural Style: Custom Built View: Custom Built Equipment: Dryer,Fire Sprinklers,Garage Door Opener, Range/Oven, Washer Other Fees: 90 Sewer: Septic Installed Topography: LL,SSLP"
"ATTN: BUILDERS / INVESTORS - Great opportunity for new construction/spec homes on large open lot in prime location! Rezone application for R-1 to an E-1 estate currently in progress (approval hearing scheduled for April 2019). Upon approval, this beautiful 2.97 acre property can be split to build up to 4 single family homes. Property currently has a 5 bd/ 3.5 bath home which produces monthly rental income. See attached for tentative site map. Neighborhoods: Rancho Mar Vista Equipment: Dryer, Range/Oven, Washer Other Fees: 0 Sewer: Sewer Connected Topography: GSL"
"Large 6BR/7BA,plus duplex guest unit,2BR/1BA & 1BR/1BA.RV Barn has office with bath & kitchenette.Duplex separate laundry's.View Deck & patios Great for large family or AIR B&B room rentals.Elder care .BR's have wet bars & refrigerators. $12,000 per mo.potential income,previously leased. Plenty of parking, land for horses,green house,kennel,etc. Seasonal stream,drainage run off on rear of property. PLEASE DO NOT drive on property or disturb owner or tenants.appointment only!With approved loan application. Neighborhoods: county,country Architectural Style: Custom Built View: Custom Built Complex Features: , Other Fees: 0 Sewer: Septic Installed Topography: GSL Guest House Est. 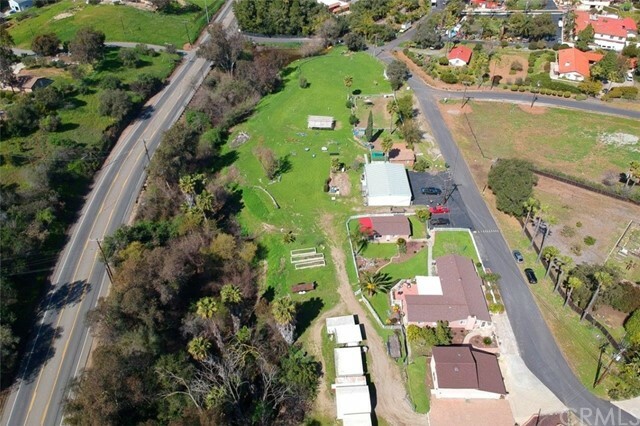 SQFT: 1800"
"A phenomenal 4.59 Acre property with so many options for use. 4.59 Acres Home: 3 Bedroom 2 bath 2108 square feet Guest House: 1 bedroom 1 bath 500 square feet 4 Car Garage 1700 sq ft with Loft and storage above 2 car spaces, 220 volts at the panel built 2016, 2000 SQFt Agricultural building, 2 Shipping containers used for storage, 2 RV carports, Tool shed with electricity, Metal Shed, Wooden Shed, 4 legal RV spots, Small studio (rented to dog trainer) additional Outside bathroom, Private Road Agreement (5 Board Members), The pond used for watering yard with pump, 3 power meters (one residential, one commercial, one agricultural), 2 Septic Systems (bottom septic tank 5 years old) 17 horses permitted(buyer to verify with the county) Plenty of room to be adventurous. Home, guest house, loft, Agricultural building, and the studio is all rented out. Water stream & pond part of the San Luis Rey Estuary. Check new county rules for granny flats." "BEAUTIFUL PARADISE!! Sprawling living and entertainment areas flow outside to the outdoor living area overlooking the peaceful pond! Downstairs has an enchanting glass enclosed INDOOR POOL with areas to lounge amidst the greenery! Spanning over 4000 sq. ft. this lovely home makes multi generation living fun! Downstairs guest suite offers an ensuite bath, kitchen, living and bedroom area with fireplace & large closet. Fabulous home for entertaining & enjoying life! SELLER FINANCING POSSIBLE! Neighborhoods: Vista Equipment: Dryer,Garage Door Opener,Pool/Spa/Equipment, Shed(s), Washer Other Fees: 0 Sewer: Sewer Connected"
"SPECTACULAR EQUESTRIAN ESTATE! Situated on 4.5 picture perfect acres with stunning panoramic mountain and country views. Home has been renovated with new bathrooms and ceramic tiles throughout. Fully landscaped with high production well for irrigation. Brand new horse facility with 3 horse stalls and spacious riding arena. This home is an entertainers dream! Enter through the private gate up the impressive paver-stoned driveway to the peaceful country setting! Neighborhoods: Bonsall Other Fees: 0 Sewer: Septic Installed"
"Spectacular Equestrian Estate! Enter through the private gate up the impressive driveway to the peaceful country setting. Situated on 4.5 picture perfect acres with stunning panoramic mountain views. Beautifully designed open floor plan with sky lights throughout allows for the perfect lighting. Family area opens to the amazing outdoor entertainer's dream space! Master suite features double sided fireplace, walk-in closets and private bonus room for multiple uses. Nicely finished three car garage with ample parking. Home has been renovated with new bathrooms and ceramic tiles throughout. Fully landscaped with high production well for irrigation. Brand new horse facility with 3 horse stalls and spacious riding area. This home is a horse lovers dream!" "Unique in every way!!! Single story, custom made, amazing floor plan with 4 bed, 3 bath, 12 ft ceilings, 13 inch crown molding, custom light fixtures, lots of windows for natural light. 11 rooms including media room with built in surround sound and projector, office, laundry/hobby room, elegant living room, formal dining room, family room. Stainless appliances, lots of cabinet storage. Master has soaking tub and HUGE closets. 4th Bed and Bath has private entrance. Beautiful Pool and spa. Great area. Neighborhoods: Foothills Equipment: Garage Door Opener,Pool/Spa/Equipment Other Fees: 0 Sewer: Sewer Connected Topography: LL"
"Unbelievable Views from this single story home with many upgrades since last sale such as Swimming Pool and spa, Solar heat for Pool, Solar heat for the house all paid for. 2.5 acres with city water and sewer on a private road. You won't find very many homes with views like this one. Fabulous floor plan with Master Suite on one end and three bedrooms on the other end. Two bedrooms have bathroom in between and could be a second master suite. See Supplement Neighborhoods: Vista Foothills Equipment: Fire Sprinklers,Garage Door Opener,Pool/Spa/Equipment, Vacuum/Central Other Fees: 0 Sewer: Sewer Connected, Public Sewer Topography: LL,GSL"
"One of a kind! Brand New Dream Home, close to downtown Vista and walking distance to Brengle Terrace Park! Our anticipated completion date is 4/30/2019, just in time to fall in love with your new home! Main House: 4 Bed 3 Bath 2,300 square feet Guest House 2 Bed 1 Bath 800 square feet Both units have their own laundry and 2 car garage. This masterpiece will be a one of a kind you don't want to miss, call us today! Neighborhoods: Vista Other Fees: 0 Sewer: Sewer Connected Topography: LL"
"Gorgeous single story home in one of the most desirable locations in all of Vista! Striking curb appeal from the front, expansive 1+ acre fully fenced lot sits privately at the end of coveted Sugarbush Drive and includes a permitted ~800 sq. ft. 1 bed/1 bath guest house, 800 well supplying water for irrigation and paid off solar that conveys with the sale! The highly upgraded interior has too much to mention here, see supplemental description for more details and move quickly, this home will not last! Neighborhoods: Buena Creek Equipment: Garage Door Opener,Pool/Spa/Equipment, Shed(s) Other Fees: 0 Sewer: Sewer Connected Topography: LL,GSL Guest House Est. SQFT: 800"
"Reduced to sell! Amazing sunset views from this gated private estate home. Custom built w/quality features include soaring ceilings, formal entry, graceful arches & curved staircase. 2-story family room w/french doors leading to the patios & pool. Master suite updated w/soaking tub, walk-in custom closet, sitting area w/view deck & fireplace. Fully fenced yard w/fruit trees, gardens, beautiful pool and spa, sand volleyball area & RV parking. Great for multi family.TWO owned solar systems for house & pool! Neighborhoods: Warmlands Equipment: Dryer,Garage Door Opener,Pool/Spa/Equipment, Shed(s), Washer, Water Filtration Other Fees: 0 Sewer: Sewer Connected Topography: LL,GSL"
"Amazing custom estate home w/sweeping panoramic mountain & valley views on 1.13 acres! This beauty boasts a grand entry, several exquisite chandeliers, high ceilings, travertine, 3 F/P's, shutters, bedroom/full bath on 1st floor & newer roof. The large Chef's kitchen has granite, SS appliances, compactor & pantry. The inviting huge great room has tall windows, French doors & a beautiful F/P! A fabulous home for entertaining w/several sitting/dining areas, salt water pool/spa, koi pond, 2 BBQ's & more! Neighborhoods: Sagewood Hills Equipment: Garage Door Opener, Range/Oven, Vacuum/Central, Water Filtration Other Fees: 0 Sewer: Sewer Connected Topography: LL,GSL"
"Reduced to $995,000- $1,175,000. Unique, gorgeous single story custom home situated on a private 1.09 acre corner lot on one of the best streets in Vista, with surrounding hill views. Newly remodeled with over $300K of quality upgrades including many new windows and doors! Entire exterior was just painted and the property boasts new 6 ft split rail fencing in front and back. Beautiful brushed travertine stone flooring in main living area, exquisite wood flooring in the office/bedroom area. Neighborhoods: Vista Equipment: Dryer,Garage Door Opener,Pool/Spa/Equipment, Range/Oven, Washer Other Fees: 0 Sewer: Sewer Connected Topography: LL"
"Picturesque valley & mountain views will captivate you from every part of this private 4 -bedroom stunner perfectly positioned upon 1.35 acres of mature landscape; which offers an expansive park like setting that is ideal for entertaining. Upon entering this 4,030 sqft estate, you will be excited by the pristine condition, bright light, spacious layout & numerous decks to enjoy summer nights in San Diego. Located in the preferred Bonsall school district. 3-car garage. RV & Boat parking. See supplemental. Neighborhoods: Southwind Lane Estates Equipment: Dryer, Washer Other Fees: 0 Sewer: Septic Installed"
"$1,025,000-$1,075,000. Beautiful 1-story custom home on 3.8 amazing acres in the upscale gated Quail View enclave of only 8 homes! Flowing floor plan w/high ceilings, kitchen w/granite & pantry, large master suite, 1 ensuite BD & oversized Milgard windows to capture natural sunlight & views of the peaceful, backyard mecca. Extra room can be guest quarters w/nearby entrance & laundry room stubbed for a bathroom. Fully fenced w/trails, serene gardens, 2 bridges, gazebo & an abundance of flora & fruit trees. Neighborhoods: Quail View Equipment: Range/Oven Other Fees: 0 Sewer: Septic Installed Topography: ,LL,GSL"
"Be the first owner of this brand new highly custom ocean & island view dream home in Vista s most exclusive gated enclave of custom homes. Situated on well over 1.5 acres! 3 spacious bedrooms 3 spacious bathrooms 3,050 square feet on main level & approximately 450 square feet of lower level flex space with double glass doors leading to private patio sporting killer views ready for you to finish to suit your specific needs & perfect for your large home office, game room, wine room etc. see suppl. Neighborhoods: Vista Architectural Style: Custom Built View: Custom Built Other Fees: 50 Sewer: Septic Installed, Sewer Available Topography: LL,GSL,SSLP"
" Neighborhoods: Vista Grove Estates Equipment: Dryer,Fire Sprinklers,Garage Door Opener,Pool/Spa/Equipment, Washer Other Fees: 0 Sewer: Public Sewer Topography: LL"